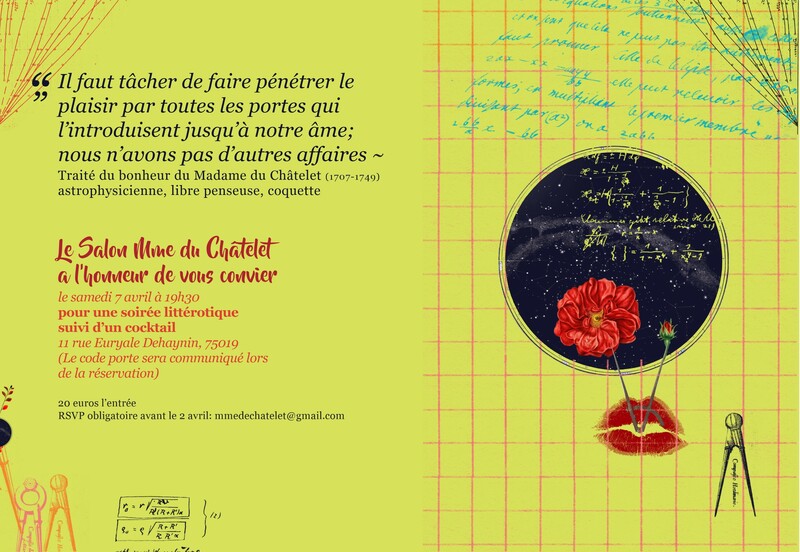 I’m proud to announce the Salon Mme du Châtelet – un salon littérotique — will happen on Saturday, April 7th 2018. We are a collective of women artists researching how pleasure enriches our aliveness and creative outpourings. By littérotique we mean that which is vibrant and life-giving in women; we’re referring to an embodied radiance, a way of being in the world that expresses itself in literature, dance, music, and the visual arts. Taking the cue from the Marquise du Châtelet herself, we embrace paradox, unlikely pairings, pompoms and use the tricks of the boudoir to illuminate fiercely engaging intellectual work. Autrement dit: we offer you an unusual and unusually enchanting evening! Come and join us — and don’t forget to reserve quickly. The room fills up fast.